We will meet in the parking lot at 10:30 am. (see image below – same place as last year, ignore those times as this image was from last year). Come hang out, bring some dinner or drinks and whatever else you’d like. The key is, bring your own stuff. I picked this spot as it’s far enough away from most everyone else and easy to spot. It worked out very well last year. We used cars to block off a safe area for kids to run around, play, hit some balls and others to stroll around and talk without the fear of other cars getting in our way. 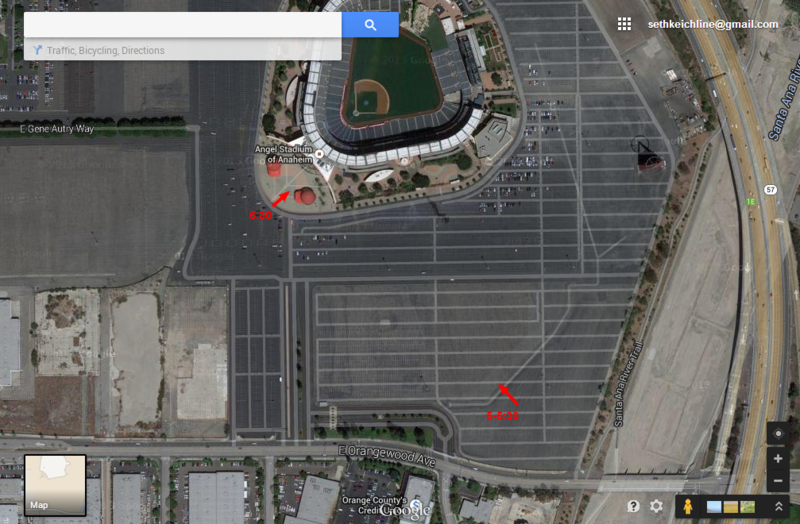 So yeah…that arrow in bottom right, that’s where we’re meeting at 10:30. We will meet between the two large Angel helmets at the front gate at noon with the goal to walk in together at 12:15 pm. GAME TIME IS 12:35. Tickets! Let’s talk about getting your tickets. We will bring them to the stadium with us. If you want to pick them up before hand, let Kristina or I know so that can be arranged. Tickets are $16 each. Payments! Let’s talk about the Benjamins. If you haven’t paid, you can bring money to the game (check is preferred, otherwise I’ll blow it on beers and Rally Monkeys). If you have PayPal, you can send it to me at austin5377@aol.com. If you want to mail a check and need our address, let me know. Thank you so much for this fantastic showing of support. It means more than you’ll ever know.